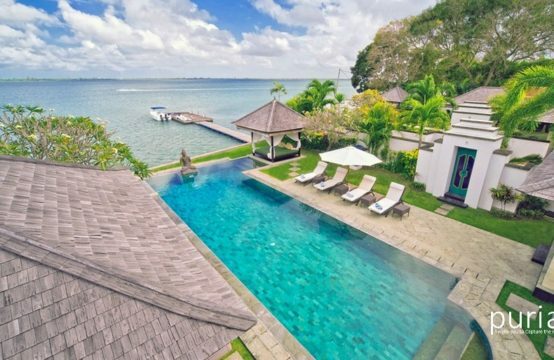 Villa Gita Candidasa is a stunning three bedroom ocean-front villa in Candi dasa, Bali. This luxury villa resort in eastern Bali has spectacular views of the Lombok Strait and amazing snorkeling just steps away. Away from the hustle and bustle of Kuta/Seminyak, this tranquil paradise in Candidasa offers one-of-a-kind accommodation and is arguably one of the best villa resorts on the eastern coast of Bali in its price range. Whether it is exploring the unique closed, religious community of Tengenan, wandering around the water palaces of Tirtagangga, or trekking in the nearby mountains, Villa Gita, offers a diverse range of experiences for new and experienced travelers alike. The contemporary-styled villa comprises three single-storey buildings at ground level. The architecture combines contemporary elements with traditional Balinese features. The villa, with open plan living/dining areas, is characterized by an abundance of space and light, elegance, and graceful simplicity. All three bedroom suites are spacious, well-lit, and fully air-conditioned. Two bedroom suites have king-sized beds and one bedroom has twin beds. They are furnished with an armchair, elegant side tables, and table lamps. Each bedroom suite is equipped with a flat-screen TV and DVD player. Wireless internet is available throughout the villa. The Master Suite Abhimanyu is also equipped with cable TV and comes with an additional desk and chair. Pool design created using the beach atmosphere. Beach umbrellas and sun beds laid out in such a way to create the beach concept in a villa. On the edge of the pool there is a shelter that can be used for massage and therapy. The roof is made of wood and natural materials that seem traditional, very impressive that you actually exist in Bali. A jacuzzi is lied separately by the pool so that guests can choose the place where they prefer to freshen up. The main Living & Dining area is located in an expansive, open-plan area which provides glorious vistas making it an ideal space for formal and informal get-together. The length of the area can be covered with bamboo blinds if required adding to the charm of the local decor. The area features timber flooring and a soaring Balinese-style roof. The living area is furnished with a comfy three-piece sofa suite and a coffee table, while a separate daybed also allows guests to relax. *The Rates are subject to an additional 15% tax and service charge. Please Email us if you want to make a booking.